The Secretary of Dairy Farmers Association in Kiraan and Chengka'ladi, Nimalan Kanthasamy, said the Tamil farmers were facing the recurrence of violence from Sinhala colonists who have started to encroach into to Periya-maathava'nai and Mayilaththa-madu, a pasture land located in the interior Ko'ra'laip-pattu South (Kiraan) division of Batticaloa district. Sinhala colonists from Polonnaruwa, Badulla and Moneragala were withdrawn last year after repeated protests. The interior land was under the control of the LTTE before 2007. The Sinhala colonists were present in the forest area for the past few days. Initially, they claimed that they had come to collect firewood with the permission of Mahaweli Authority. However, as of Wednesday, the encroachers started to clear the forest land and began to prepare the grounds for agriculture. 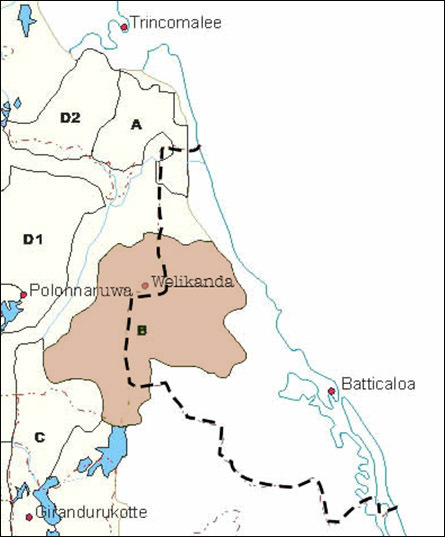 The SL Mahaweli Authority, which comes under the purview of the SL Ministry of Mahaweli Development, led by the SL President Maithiripala, is expanding Sinhala settlements from Polonnaruwa district in the North Central Province and eastward into the Eastern Province. The latest encroachment comes despite a previous court order evicted most of the Sinhala colonists, who had settled in the area and were expanding the colony with a Buddhist temple in 2016 and 2017. Following repeated protests by the Tamil dairy farmers whose cattle were slain by the encroaching colonists, occupying Colombo withdrew the settlement. However, one colonist was staying in the area to maintain the status quo. The guards of various SL departments were also roaming around during the past two years. In the meantime, Vinayagmoorthy Muralitharan alias Karuna, a paramilitary leader operated by the Sri Lanka Army in the East, is converting 550 acres of pasture lands to his supporters in the same paste lands 1 km away from the area where Sinhala colonists are encroaching.